Car won’t start, dead battery, frozen fuel lines, broken wipers, and more… Cold weather car problems can cost you a lot, both in time and money. With the temperatures we’ve been having this winter, car problems have abounded. And it’s not over yet. The Old Farmers’ Almanac is predicting more cold weather on the way for Toronto and the GTA. Even when you’d rather stay inside, you still need your car to get around. Unless you have a heated garage, your vehicle is exposed to all the elements. If that’s the case, read on for how to keep your car – and your wallet – warm. If your car won’t start in the winter, the cause is likely a dead battery. Jumper cables can get it running again. Or prevent it from happening in the first place by keeping the connections clean, tight, and corrosion free. You might also consider replacing the battery every so often (the Car Care Council recommends three years) or purchasing a battery warmer. 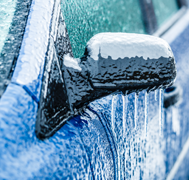 The gasoline in your car won’t free, but the gas line can form ice if there’s water moisture inside. To avoid this, don’t let your gas tank get too empty. A good rule of thumb when it’s cold out is to keep your tank at least half full. Sub-zero temperatures can wreak all sorts of havoc with windshield wipers, from cracking the rubber, to wiper transmissions breaking. And then there’s the problems that arise when windshield wiper fluid to freeze. You might consider buying wipers made specifically for winter. But in general, you should be all right if you replace your wipers fairly often – every year or two. Make sure that you clear off the windshield fully before turning on your wipers. As the air gets colder, so does the air in your tires. This makes the rubber contract and have less pressure meaning – you guessed it – deflated tires. Stay ahead of the cold by checking tire pressure more often. The Car Care Council actually recommends checking once per week in the winter. Don’t let tires run below the manufacturer’s recommended pressure. It can also help to invest in winter tires. Older alternator belts can get so cold that they break (also called “snow snakes). The best solution here is prevention – take your car in for maintenance before the cold hits. If the problem has already happened, it might be time to bring your car in for repairs. Keep your car safe from the winter cold with regular inspections and maintenance. If the upkeep is too much, you might consider a personal loan. For instance, at Prudent Financial we offer loans based on a paid-off car that is less than six years old. Even when the temperatures drop, your bank account doesn’t have to! Contact us today to learn more about our car loan financing services. Call 1-888-852-7647 or visit www.prudentfinancial.net.